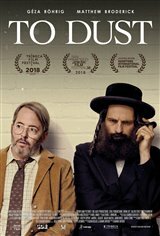 Grieving the recent death of his wife Rivkah, Shmuel (Ge´za Rohri¨g), a Hasidic cantor in Upstate New York, decides that, in order to move on, he wants to understand the science behind the decomposition process of his wife’s body. He asks biology professor Albert (Matthew Broderick) to give him informal science lessons. These soon grow to include homemade experiments and a road trip to a body farm, and, as their macabre misadventures and unlikely friendship grow ever more peculiar, the odd couple prove they will stop at nothing to satiate their curiosity and, ultimately find Shmuel the peace he seeks.